The rigorous and sensitive nature of the environment in which we operate demands that our members are competent and experienced mountaineering professionals. Be comfortable operating in a high angle, high exposure environment. Capable of grade 5.5 rock climbing. Conversant with glacier and crevasse rescue techniques. Graduate of the Mountaineers basic mountaineering course, or equivalent mountaineering experience. Currently active in mountaineering and climbing. Possess a current first aid and CPR training card. Be a minimum of 21 years of age and in good physical condition. The OMR Application can be downloaded here. Potential applicants must attend a general meeting before their application will be reviewed by the board for recommendation to membership. Applications to OMR will be accepted throughout the year. These applications will be kept on file by the Membership Coordinator until time for processing in the fall. September 30 of each year is the last day applications will be accepted for the next membership cycle, with exceptions made at the board’s discretion when the applicant’s experience permits them to enter the current membership cycle. Our meetings are held on the second Tuesday of each month at our headquarters (the former Westgate Fire Hall) at 1550 Rocky Point Rd, Bremerton from 1900 hrs to 2100 hrs. If you are an experienced climber and are interested in making a genuine commitment to search and rescue, we invite you to attend. The board of directors reviews all applications and selects the individuals to accept as trainees for the January – June training cycle. Members selected for the training cycle will be directed to fill out the Kitsap County DEM Application. This form will need to be signed by the applicant and the Chairman of OMR or an OMR representative. Members will not be able to participate in field trainings until this application is approved and a DEM card is issued. Members selected will be directed to complete online the IS-100 (Introduction to Incident Command) and IC-700 (National Incident Management Systems) with a passing grade and submit their certifications to the Membership Coordinator. These can be found at https://training.fema.gov/nims/. Members selected will also need to complete either the “Helicopters in Search and Rescue” course from the MRA web site (training.mra.org) or participate in an A-100 course in person (see OMR’s Training Coordinator for specifics). Certificates must be provided to the Membership Coordinator for OMR records. Skill specific training will be conducted the first six months of the year and attendance is mandatory. Any absences will need to be approved by the Chairman or Vice-Chairman of OMR. Members not meeting participation requirements will be denied membership and directed to reapply the following year. Pending satisfying the above requirements, the board will review the trainees status and will make a recommendation to the membership to accept these prospective members in a vote at a general meeting in the spring, following completion of training requirements. I am an experienced climber. How much training is required? All active unit personnel are required to meet and maintain rigorous training standards set forth by the National and State Mountain Rescue organizations. This ensures that we can respond to any wilderness emergency with all of the skill required to safely accomplish the mission. Maintaining this skill level requires that all members actively participate in unit sponsored training. We regularly train at our monthly general membership meetings and dedicate one weekend a month for field training. How often does OMR get dispatched on rescue missions? We are mobilized by the Washington Department of Emergency Management, the County Sheriff, or the National Park Service in the event of an accident, lost or missing person, or a downed aircraft in the wilderness. The number of call-outs we receive each year has been increasing. In 2017, OMR was dispatched to over 60 rescue and recovery missions throughout Washington State. How often will I be required to respond? 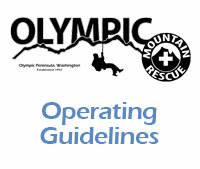 Olympic Mountain Rescue is a 24/7/365 operation. Volunteers are encouraged to respond as often as they can to missions, but we understand everyone has different amounts of availability. Personal climbing equipment and the training and experience in its use is required. Applicants are expected to be competent in the use of crampons & ice axe. What else does OMR do? In addition to our search and rescue role, we actively promote and participate in outdoor safety education. 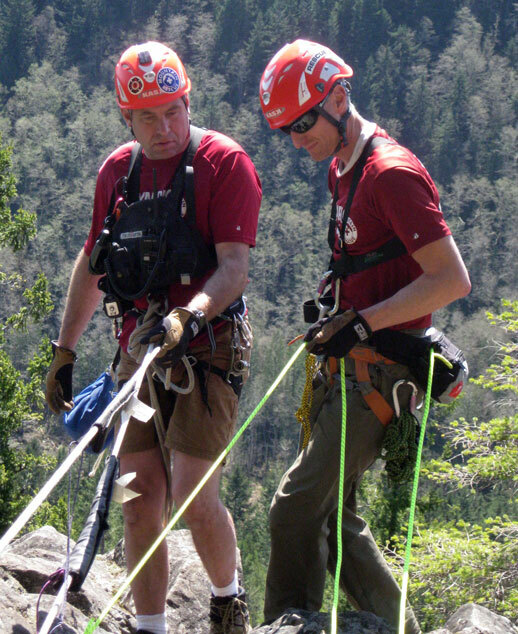 The unit offers training to the Olympic College Basic Mountaineering class, National Forest Service and Olympic National Park personnel and other outdoor oriented groups.